A productive few days in spite of the weather and the culinary attack on our waistlines. 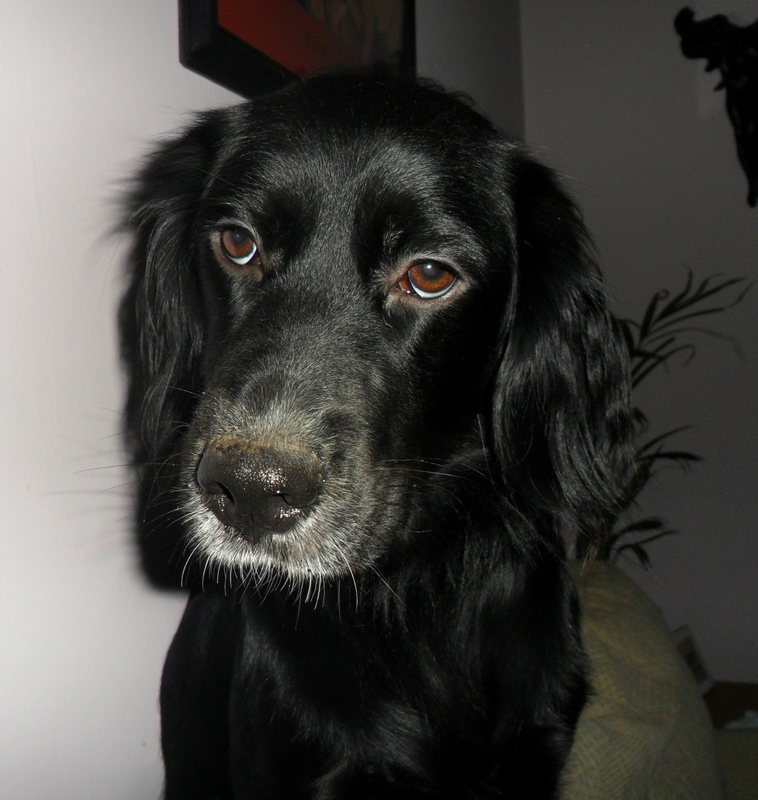 At least yours stopped with Sunday lunch… mine went on to valiantly tackle a curry and dispose of a chocolate rabbit. Tomorrow I starve. Still, it does seem as if the nagging feeling about getting back out to North Marston bore fruit after all. 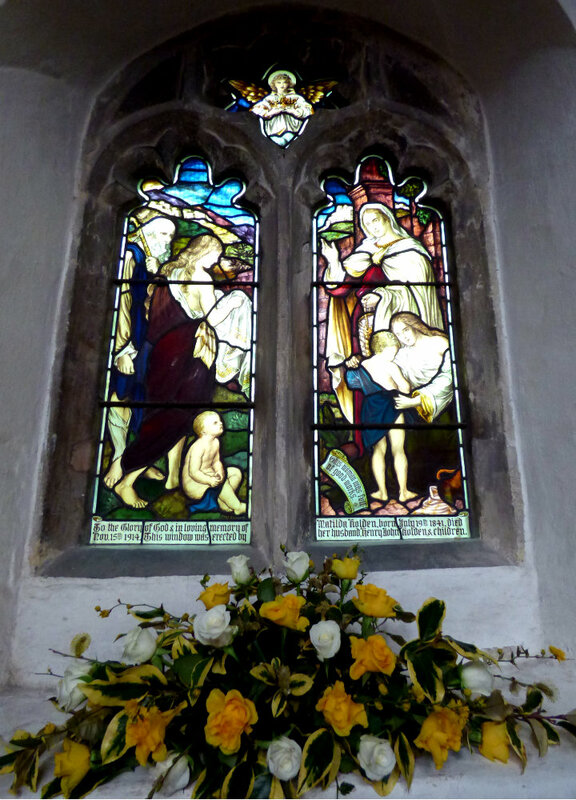 I did a bit more digging about the church and Sir John Schorne… and the window is one of our Nine Marys. The name of the village is Anglo Saxon… the ‘village by the marsh’, apparently. 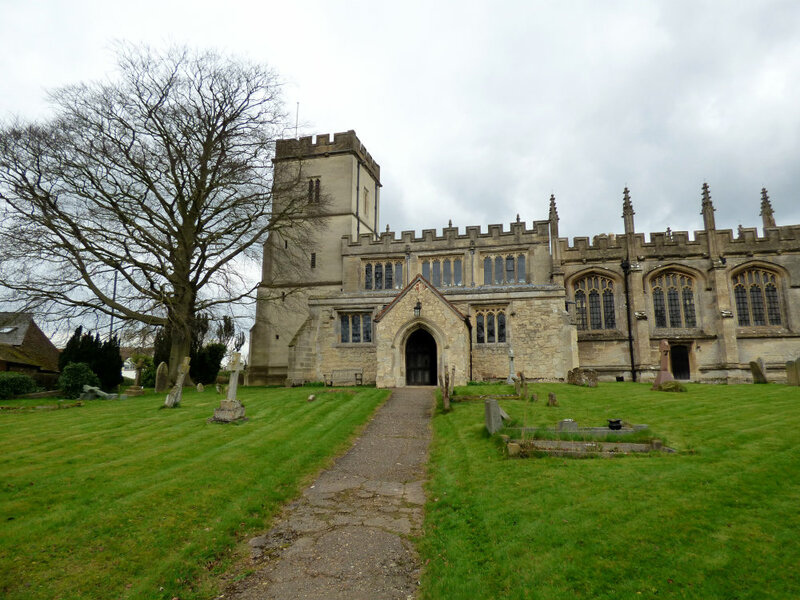 The church itself dates back to the 1100s, which means it was already well established when John Schorne became the rector in 1290. Legend has it that the chalybeate healing well sprang from the ground during a time of drought when Schorne stuck his staff in the earth. Then, there is the tale of his having been desired to exorcise a woman possessed by devils… and commanding the Devil to leave, captured him in a boot… which seems an odd sort of tale. Even odder, when you think the bit on the window says he ‘conjoured’ the Devil into the boot! It became a place of pilgrimage when Schorne died until his tomb was moved to St George’s chapel in Windsor, which we tried to visit…. 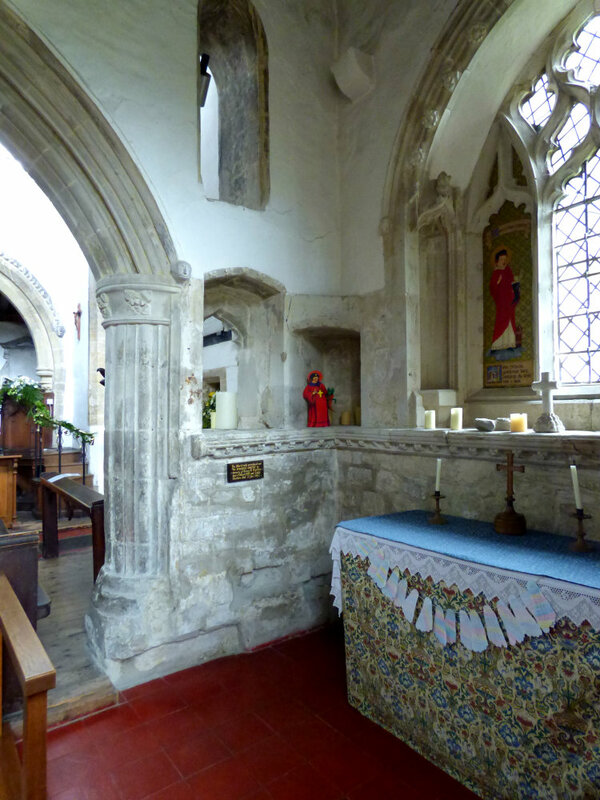 Curiously, the tomb is thought to have been in that south aisle where we sat so long that first visit commenting on the ‘feel’ of the place. Funnily enough, given the story at North Marston, Schorne was previously the vicar at St Dunstan’s in Monks Risborough… you may recall the church, just below the hillfort and chalk figure of Whiteleaf Cross… the same church with the statue on the wall depicting St Dunstan subduing the Devil with his blacksmith’s tongs. That he was heard three miles or more! 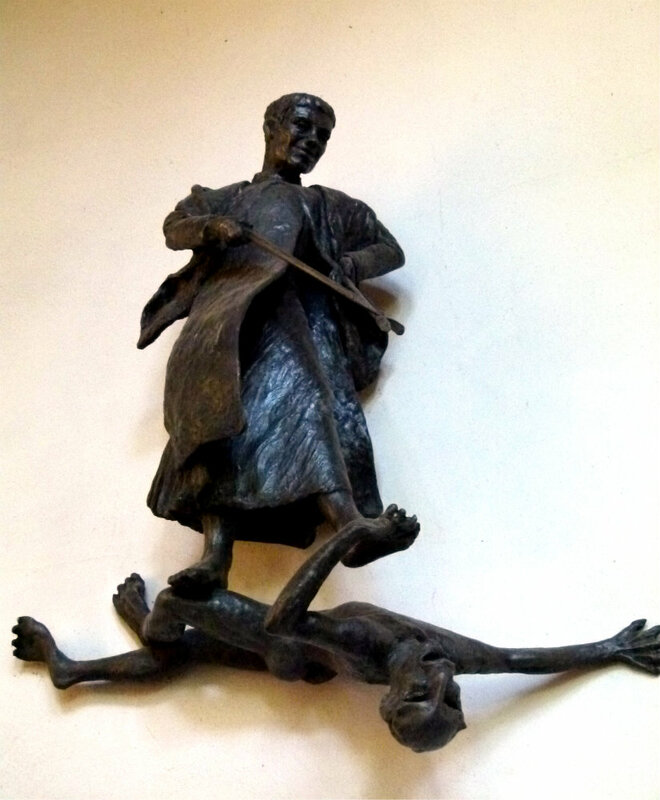 As if that wasn’t enough, the Devil tried again whilst Dunstan was in the forge, but the saint nailed a horseshoe onto one of the devil’s cloven feet which is why the devil cannot abide horseshoes. Even curiouser… given the book we were looking at earlier… St Dunstan, related to the royal family of Wessex, was born near Glastonbury in c.909AD…Now that is just too much of a coincidence to ignore! 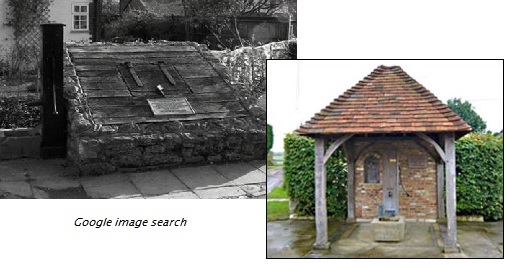 The holy well at North Marston is an iron rich spring, reputed to be good for gout and toothache and held responsible for many other miraculous cures, including keeping the village safe from the cholera epidemic of 1835. I was right about there having been wooden trap over it. The water used to stand open to all, but in 1861 Jane Watson drowned in the well and it was covered. I was wrong about it still being covered in that way… it has been restored recently and covered in a more fitting manner. Wow, what a lot of strange tales. Now I need to know what are the Nine Marys and what do they signify? I thought it was interesting that this church bears so many stories of the devil and others conquering him and the strange things that happen in them. My goodness, this must have been a village and town where the people were covered with witchcraft, etc. Thank you so much. Good telling! The marys are those referred to in the New Testament, Anne. There are various counts, but you can find then all on Wiki here: https://en.wikipedia.org/wiki/New_Testament_people_named_Mary. As to the mention of the devil, it is a common motif in symbolic tales for the devil to tempt or harass saints… and had nothing to do with witchcraft, which was a nature-based pagan practice demonised as devil worship by the Church.